← Several Photos Taken of Unusual Objects in Poplar, MT. RADAR RETURNS & ENLARGEMENT OF RETURN AREA. 1. I was showing my friend from Brazil the Milky Way that you can see clearly in Northwest Montana. It was about 11:30 PM Mountain time. 2. We were walking back to my house and looking at the sky when a bright and large “orb” came floating slowly above and out from behind a nearby mountain. 3. When we saw it we both were surprised and the Brazilian, he was scared more than I. We were both fascinated. It was immediately recognizable as a nontraditional flying craft. It was obviously too large, too slow, and too silent to be a plane or helicopter and both are uncommon in my area. 4. The Craft/object was moving slowly, silently, and steadily Northeast. It “floated” directly above us at around 5,000 feet. The closest large mountain nearby is about 7,000 feet and this craft was not as high up as the top. As it passed over us and the surrounding pasture it was emitting a bright white light similar to a welding torch. What I think is somewhat interesting is I waved my hands, shouted at it and flicked a lighter and I can’t be sure, but it almost seemed like it “realized” we were there, it’s lights began to dim to nothing and it revealed what I recognize/(believe to be) as an Isosohedron made of what looked like hot metal. It seemed to cool off after diming it’s lights off and as it did this the hot metal look faded and it became no longer visible against the night sky as it moved off in the distance. From what I saw it was clearly a large solid, metallic geometric shape because of the size it appeared to be at it’s altitude. It was appearing about the size of my little finger nail while at about 5,000 feet so I guess it was actually somewhere around 20 to 40 feet around in circumference. 5. I was surprised and mildly fearful/cautious, but I was more interested and in hindsight maybe too curious. This curiosity overcame any fear I was feeling. My Brazilian friend was scared and told me to stop trying to get it’s attention. He said he had no doubts that what he saw was unique and a UFO. I think it is a craft of some metal that is clearly developed by an intelligence that understands geometry. I also think it that it was not “intending” to be seen. 6. I think it obviously noted our presence and then began to behave differently by “turning off” it’s light, cooling and fading into the dark sky around it becoming no longer visible. Note: This case was called to my attention by Robert Powell who is MUFON Director of Investigations. 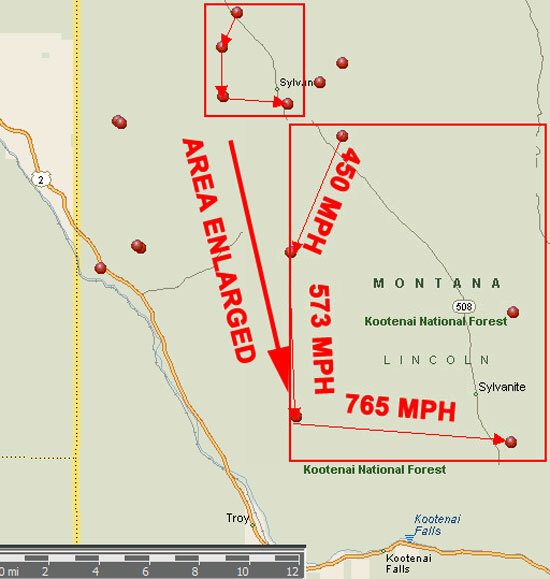 I am a certified field investigator for MUFON for Montana so Robert suggested that I take a look at radar data. Subsequently I requested radar data from the Federal Aviation Administration (FAA). I requested data from the closet long range radar (Kalispell, Montana). Kalispell is about 75 miles to the east-southeast of Troy. The radar has a range of at least 200 nautical miles so the radar would pick up returns in the Troy, MT area. The radar (see graphic near top of page) did not show returns where the witnesses saw the orbs. However, radar did track an object around 20 miles to the Northeast of the sighting location at 11:32 PM. This was near the time that the witnesses saw the orb. Radar tracked an object that moved to the south-southwest at 450 MPH, then the object slightly changed direction to the south and sped up to 573 MPH and then abruptly turned to the east and sped up to 765 MPH. THIS OBJECT WAS NOT AN AIRCRAFT. THERE WERE NO AIRCRAFT TRANSPONDING IN THE ENTIRE AREA. This is an isolated area and one devoid of much air traffic. Also it was 11:30 at night making which means that less air traffic would be occurring. It is not known if the unusual radar returns are related to the sighting report. This entry was posted in Montana UFO Sightings 2016, Unidentified. Bookmark the permalink.